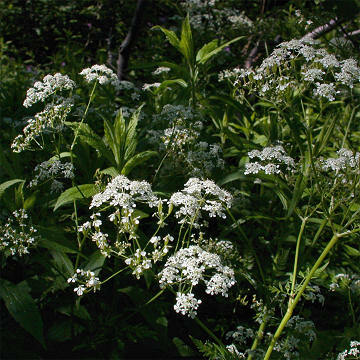 Poison hemlock (Conium maculatum) is a biennial herb that can grow to 3 m tall. It has a smooth stem that is often purple-streaked or spotted. The leaves are broadly triangular and divided into 3-4 segments with finely divided leaflets. 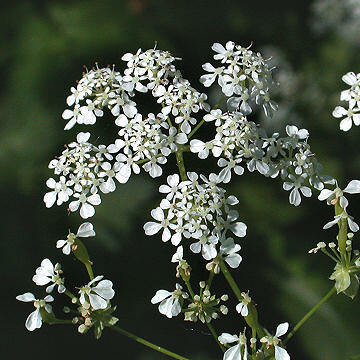 The white flowers are produced in umbels up to 6 cm wide and rather resemble a large Wild Carrot (Daucus carota). This species is native to Eurasia but has been introduced and has spread widely throughout North America. Most often found in partially shaded, disturbed areas on soil ranging from dry to wet, it is perhaps best known as the plant given to Socrates after he was sentenced to death. All parts are extremely poisonous but the parts of the plant that are most toxic are the seeds and root. Below is a composite image of Common Mullein (Verbascum thapsus). This species has naturalized throughout most of temperate North America and typically occurs in disturbed areas. 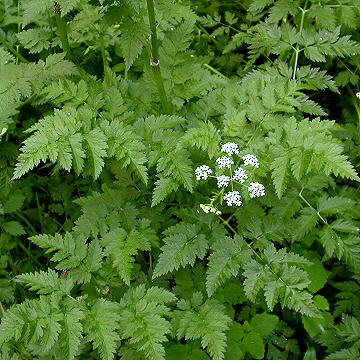 It is a biennial, most easily recognized by the low rosette of densely fuzzy leaves in the fall of the first year or spring of the second year. By summer of the second growing season it sends up a tall, dense spike of yellow flowers. Mature flowering stems can reach 2 meters in height.